"Basically a stick box with a Raspberry Pi running PiMAME" were the words the client used to describe what he envisioned. From first concept to first assembly it took about 45 days, starting in late March and ending May 2014. 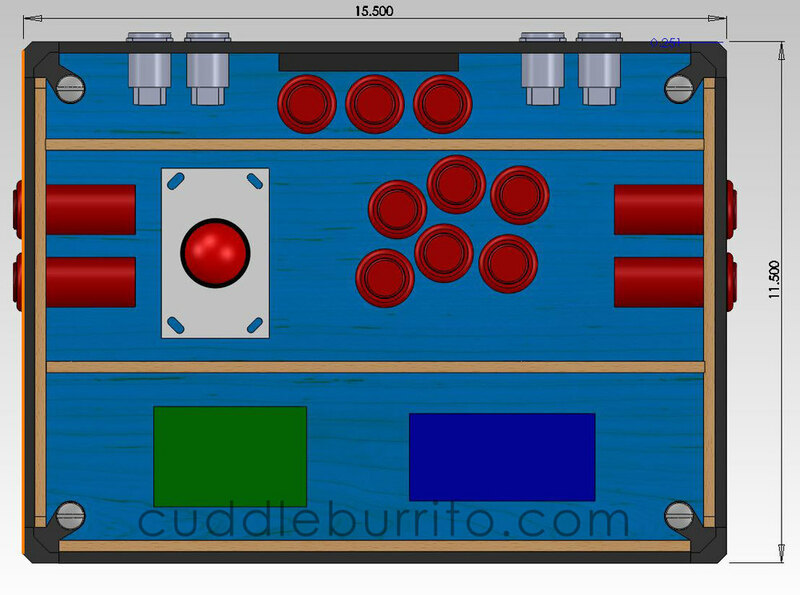 A user from the forums on shoryuken.com saw my previous work and commissioned a custom case to house a Raspberry Pi computer, the joystick/ buttons, and the electronics; in essence a bring-your-own-tv arcade. 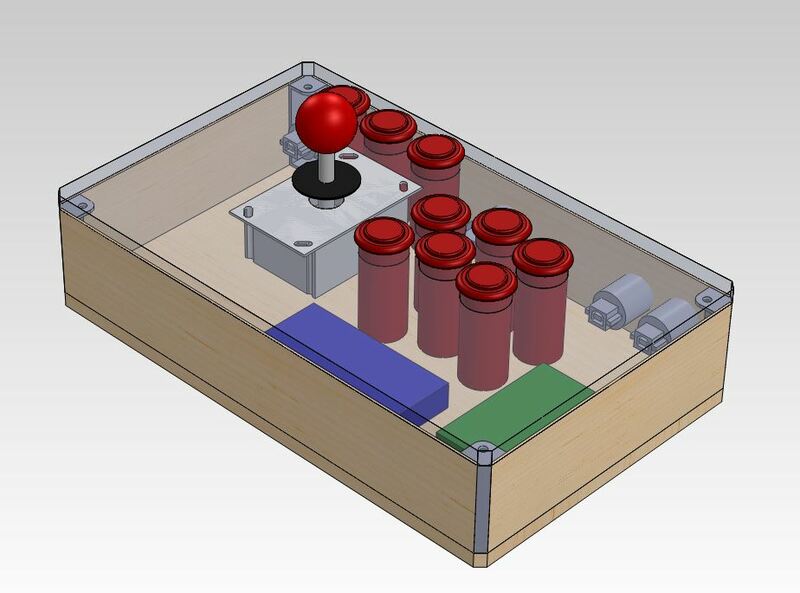 I jumped at the opportunity because I've always wanted to make a Pi arcade box! 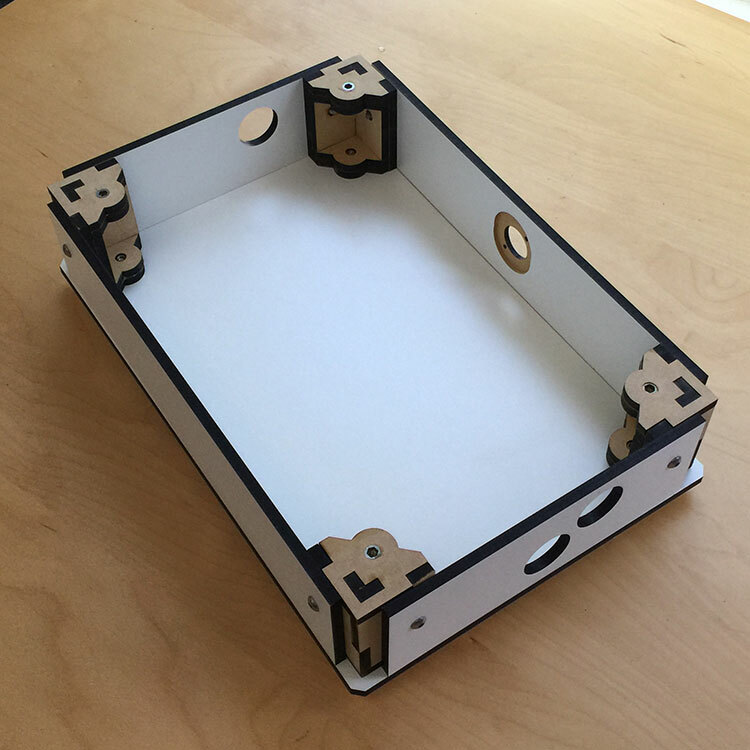 Most of the frame is laser cut MDF, fastened together with 3D printed corners, and finished with a nice wood grain top plate that is also laser cut. Many details varied while iterating over the design. Much back and forth discussion went into deciding dimensions by measuring the maximum bend in cables and where the palms would rest. The case started smallish but soon increased in size when concerns arose about tight turns the internal cables would be making. Moreover, a larger surface was more comfortable since it offered ample palm resting space and allowed for additional buttons on the sides. It's always nerve wracking to wait for your custom parts to arrive only to find out there was a problem; lucking mine were only cosmetic. The piece of wood I received for the top plate had dark splotchy marks all over while the opposite side was beautiful. From a distance, it looks fine but up close I really didn't like it. I ended up sanding and oiling both sides to see a clear difference. I'm in process of receiving new parts made using a different and more consistent wood. Stay tuned. Two sides of the same top plate to show how much better the right looks. After the frame assembled without a problem, I 3D printed some feet that hide the bottom bolts and raise the unit too. What's next? I want to improve serviceability, cable management, and customization and I have a multitude of ideas for each. Cable Management - Since most of the controls are mounted to the top plate, managing all the wires that need to connect to the electronics is important. The next revision would explore different solutions to make it clean and organized for the user. Cable tie downs and a wire harness are likely possibilities here. 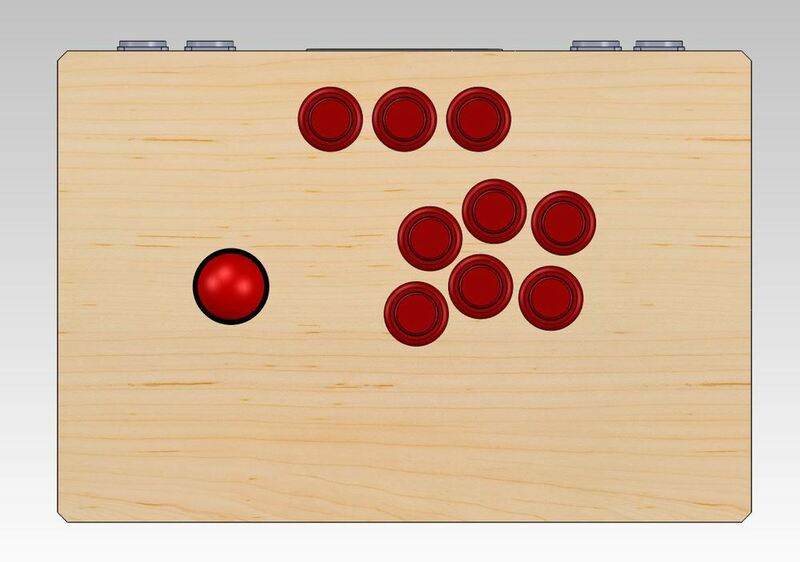 Customization - There are endless possibilities here: engraving labels for the buttons and ports, laser etch unique game art on any face, any color 3D printed parts with acrylic sides, etc. Whatever your dream case is, we want to be able to build it for you. This means spending a little time improving the manufacturing process of the components and making the digital art more consistent to apply. Please leave a comment and let me know what you think or what you'd like to see!